LAFAYETTE, La. – Freshman Jonathan Windham delivered a two-out RBI single in the bottom of the tenth to lift the Louisiana Ragin’ Cajuns baseball team to a 4-3 victory over No. 13 LSU on Wednesday night at M.L. “Tigue” Moore Field. Senior Colten Schmidt notched a quality start in the game limiting LSU to one run on five hits in a career-high eight innings. Schmidt had five strikeouts in the outing and faced the minimum over his final four frames. Gavin Bourgeois, Daniel Lahare, Hayden Cantrelle and Hunter Kasuls each had a pair of hits in the game, while Kasuls had a game-high two RBI. Bourgeois extended his on-base streak to seven games, and both Kasuls and Cantrelle reached base three times. LSU grabbed a 1-0 lead in the top of the first inning on a two-out single to center by Beau Jordan. 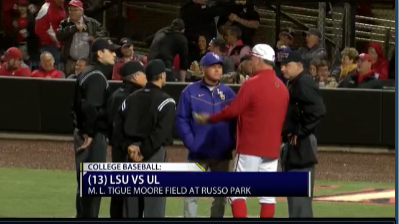 Louisiana threatened in the bottom of the second loading the bases with no outs, but LSU starter A.J. Labas got three straight strikeouts to preserve the lead. The Ragin’ Cajuns broke through in the bottom of the eighth on a two-run bunt single by Kasuls on a suicide squeeze play to take a 2-1 edge. Cantrelle added another run later in the inning bringing home Kasuls on a two-out single to centerfield to increase the advantage to 3-1. The Tigers would answer though in the top of the ninth with a two-out, two-run double to right centerfield by pinch hitter Austin Bain to even the contest at all 3-all. In the bottom of the tenth inning, the Ragin’ Cajuns loaded the bases with two outs after a Lahare single and walks to Kasuls and Cantrelle. Windham lifted the first pitch he saw from Bain back up the middle into centerfield for a single to give Louisiana its first walk-off win of the season.